Property Size 4,547 sq. ft. 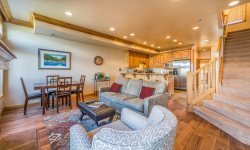 This Trappers Ridge home is the largest in Utah Lodging’s fleet with an impressive eight (8) bedrooms and five (5) baths on three (3) levels, it’s perfect for larger groups or “mancations”. All levels have living areas with TVs and comfy couches so that everyone can relax and watch the big game or favorite shows. The main level has an open great room for living, dining and kitchen. Off the dining area is a viewing deck with outdoor furniture and gas grill. The main level has three (3) bedrooms with three (3) baths. Upper level has two (2) bedrooms that share one bath with an elevated view living room. Downstairs continues the open floorplan with a pool table, wet bar, living area with love sacs and patio with in-ground hot tub. The lower level has three (3) bedrooms that share a bathroom and a laundry room. They got back to us quickly when we had questions. Were accommodating with checkout time. Great property. Each floor had its own air/heating thermostat which was nice. Wish there would have been couches in the basement, but all in all a great experience!! We had a great time and enjoyed our stay very much. I hate to say it but Eden, Utah is a hidden and undiscovered gem. What a wonderful place to bring a large family reunion group with so many things for everyone to do and enjoy. Team members were kind an knowlegable.